Stories need to be created for two specific goals. They need to be rational, which facilitates consumption. They must also hit the emotional, which spurs sharing. A traditional classroom setting at DePaul University is providing an appropriate platform as an impressive collection of speakers continues to teach the assembled group of PR professors about "storytelling at the speed of now." 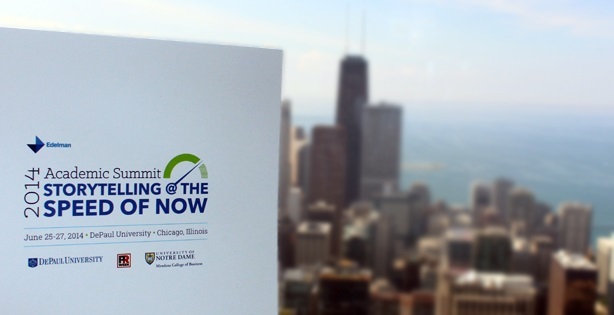 That's the theme of this year's Edelman Academic Summit, presented in partnership with DePaul and Notre Dame University. The day commenced with Richard Edelman, who emphasized that stories need to be created for two specific goals. They need to be rational, which facilitates consumption. They must also hit the emotional, which spurs sharing. While elaborating on the numerous opportunities for PR in today's always-on world, Edelman focused on how media is evolving. He noted there is more revenue now in circulation than there is in advertising. The result: media owners are reinventing business models. And a key element in that is sponsored content, which comes in many forms under the umbrella of native advertising. And who provides a lot of that content - communicators. Enormous opportunity. A key focus of SC Johnson COO Salman Amin during his presentation was talent. As agencies evolve from fragmented silos to truly integrated models, he says PR pros must become fundamentally multidisciplinary in their approach, which will enable storytelling that works on multiple levels. Linda Thomas, managing editor for online news and content strategy at Starbucks, explained how storytelling is all about emotion. The way to tap into that is to focus on people, not products. "You can't see emotion in a coffee cup," she asserts, "but you can in a story about people." Moreover, brands' online newsrooms are not media sites, stresses Thomas. They are vehicles to reach and impact consumers, which is very much still of interest to the media. AMD's CMO Colette LaForce kept the focus on emotion and why it matters in b-to-b storytelling. Whether it's uniting employees around a common message or clarifying your brand identity for consumers, emotion must be infused in the narrative, often at the expense of the traditional "speeds and feeds" messaging upon which companies such as AMD long relied. Bill Chandler, SVP of global corporate affairs at Gap Inc., highlighted his company's "Do more" platform, in which the brand is committed to do more than sell clothes. Its decision earlier this year to raise the minimum wage is an example. And how did it tell that story first? A microsite, not a press release. That willingness to think differently in how to convey your story can truly amplify it. Carolyn Castel, VP of communications at CVS Caremark, closed the day by sharing her strategy around the company's decision earlier this year to stop selling tobacco at its locations by October 1 of this year. The move itself was historic, of course. However, she emphasized, great effort was also put into making it easy for people to share this story and spread the word. A dedicated landing page played a key part, as did shareable and Twitter-friendly headlines. Moreover, efforts focused on ensuring all CVS Caremark employees had a unified message. An obviously worthwhile story was amplified by a dedicated storytelling strategy, ensuring the monumental decision got the attention and understanding it deserved. During his early-morning speech, Richard Edelman noted that this is becoming the era of communications marketing, instead of marketing communications. The shifting of the words is much more than symbolic. It indicates the increasing relevance and prevalence of the communications function that excels at storytelling. That's a story everyone in the industry should not only be excited about, but one for which they should be eager to write their own chapter.